Cell Stress acknowledges that excellent manuscripts may be rejected from other high-impact journals after having been revised. That is why, through its Fast Track option, Cell Stress offers authors of such manuscripts the possibility to submit their paper together with the anonymous referee reports obtained upon rejection in another journal. Usually, the authors add a rebuttal letter and provide a revised version of their previously submitted manuscript. Using this Fast Track option, a handling editor will take the previous reviews and your possible amendments into account to make a fast decision. Note, that in some cases the editor may choose to take advice from an additional referee. Of course, authors are welcome to submit their rejected paper to Cell Stress afresh without reference to the previous process – in that case, please proceed with a regular submission. 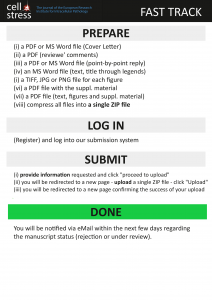 If you want to proceed with a Fast Track submission, prepare your files as described below and submit through our submission system. Note that in order to submit a manuscript you must login first with the username and password determined upon your registration to Cell Stress. If you have not registered yet, please register here. 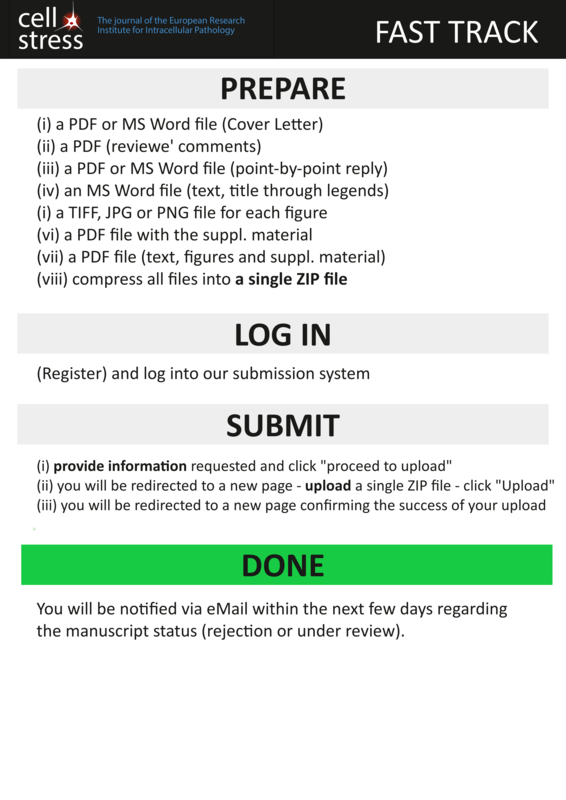 Below you can find a visual overview of the steps required for submission (please click on it to enlarge). This is followed by a detailed description. Please refer to the chapter Manuscript Preparation to get your manuscript ready for submission. (1) Please provide the cover letter, the point-by-point reply as well as the main text (title through figure legends) as single documents, respectively; MS Word format is preferred but, if necessary, *.rtf-files can also be accepted. Please consult the chapter Manuscript Preparation to get your manuscript ready for submission. (2) Figure files should be provided separately and be prepared as described in the chapter Figure Preparation (see Preparation of Specific Sections). (3) If you are also submitting supplemental material, please refer to the chapter Supplemental Data. Supplemental material should be provided separately as a composite PDF file with embedded figures. (4) Generate a PDF file containing the main text (title through figure legends), the figures and the upplemental material. (5) Compress the resulting files into one single .ZIP file, which is now ready for upload. Should you need assistance in generating a .ZIP-file, please press here. The .ZIP file should preferably not exceed 15 MB in total: if it does, please contact us.